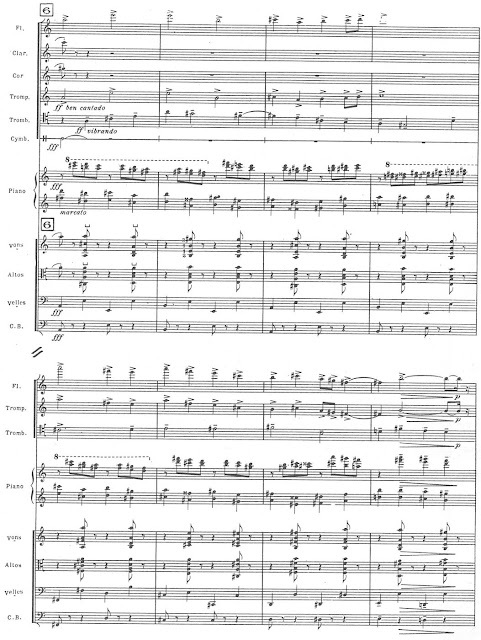 One day in a music history class in the autumn of 2016 (shortly after launching this blog), my students and I were huddled around a study score of Jacques Ibert’s Divertissement. It is a piece I like very much—très amusant. Ibert derived the suite from some incidental music he wrote for a 1929 production of Labiche’s hilarious Un chapeau de paille d’Italie (a stage production directed by René Clair, following hard upon Clair’s silent film adaptation of 1928). SOURCE: scan of Ibert Divertissement (Durand, 1931, reprint n.d.), p. 17. Soon after class, I pulled a few other recordings off my shelves, but none of them had this extra horn line. (This figure happens twice: Reh. 6, and then again at Reh. 10 up a half-step; the horn part seemed the same in both places on the Tortelier recording.) There was nothing in the Chandos liner notes to indicate that this recording featured a new edition of the score. Anyway, I mentally filed it away to explore later. Returning to it about two months ago, I was just as mystified as before. I investigated getting the performing materials on perusal to see if anything useful was there; but, as the US distributor is Boosey & Hawkes, that effort proved prohibitively expensive. 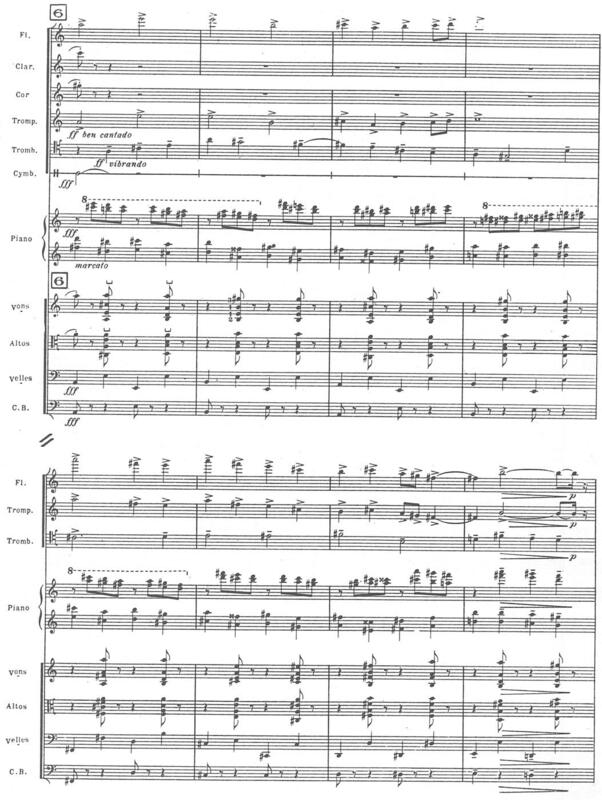 Moreover, a more recent recording from Chandos—an excellent one with Neemi Järvi conducting the Orchestre de la Suisse Romande [CHAN 5168]—clearly manifests the text as printed in the Durand score. SOURCE: my attempt to transcribe the rogue horn part at Reh. 6; I thank my colleagues Paul Rawlins and Michael Bratt (both University of Mary Washington) for their willingness to tackle the same problem. I then sent what I had to Mr. Tortelier’s agent and wondered if I would get any reply. 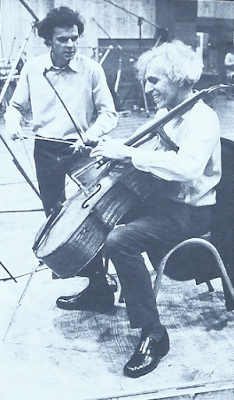 A few weeks later it came, revealing that the source of this interpolation was his father, the esteemed Paul Tortelier (1914-1990), cellist, composer, and conductor. Indeed the passage at Reh 6 for 8 bars as well as the one at Reh 10 for another 8 bars have an added and indeed optional horn part counterpoint which was added by my father Paul Tortelier and is none other than the main theme of rehearsal 2 ( trumpet pianissimo ) and tutti forte at 4 but in this instance it is funnily clashing with the same tune played in augmented values on trumpet and flute. SOURCE: detail of scan of Ibert Divertissement (Durand, 1931, reprint n.d.), p. 12. 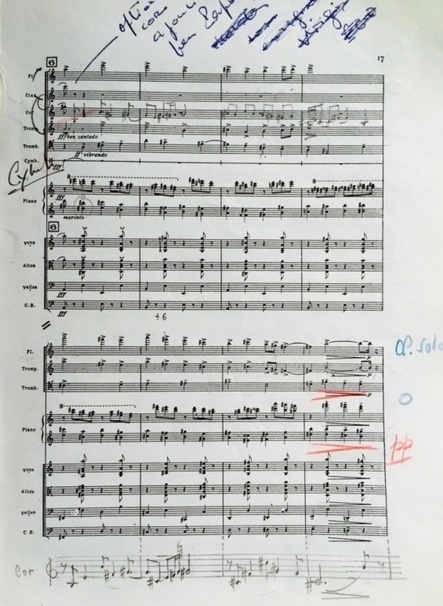 SOURCE: Durand score p. 17 with Paul Tortelier's interpolated horn part in manuscript (by courtesy of Yan Pascal Tortelier, email 6 May 2018); for the parallel passage at Reh. 10, see this page. I haven’t actually been able to locate any recording of the Ibert conducted by Paul Tortelier, and it may be that he performed it thus without ever actually committing it to disc. There is something charmingly audacious about this addition—in a way showing a loyalty to the impish style of the composer even while departing from fidelity to the text as such. I am glad that Tortelier fils shared his father's inspiration with a wider audience. It is a remarkable moment, and when I now listen to other recordings the original text seems... well, not bland, but at least a little lacking. All this prompted me to wonder, though, what other contrapuntal “Easter eggs” (to borrow a gaming term) are lurking on recordings of standard literature—whether intentional interpolations by the conductor or as pranks by the players. As a continuo player, I have in my realizations occasionally introduced a snippet from another work as a sort of countermelody. (I have found that the phrase “Way down upon the Swanee river” works particularly well.) I imagine others have amused themselves in similar ways. I would be happy to add an addendum to this post if readers can point me to other examples.